Cairo offers a potpourri of musical styles, from traditional to pop to jazz. I hope this guide will help you discover the exciting musical scene in Cairo! This event listing site for the expat community covers major events in Cairo, including the Tannoura (it is literally "skirt" but means "whirling dervish dance") in the Citadel. The El Sawy culture wheel is Egypt's representative cultural center, showing a wide variety of Egyptian and non-Egyptian performances. Some traditional Arab music. Multiple indoor auditoriums and one large outdoor venue. Arab classical music, European operas, symphony concerts, ballets, and the like. The opera house has its own orchestra and opera and ballet company. Many foreign governments also send their orchestras, ballet companies, theater companies, and other performing ensembles. This is the jazz club most representative of the Cairo jazz scene. Nice and clean. Smoking permitted. It also presents pop bands and dance parties with a DJ. Online ticketing available. The young people's Cairo dive. Smoky. Danceable pop music. Follow my directions closely or you won't find it! The best known dancer, Dina. International hotels offer belly dance shows in their restaurants, with a small band. You pay for what you eat and drink as well as the table charge - the total bill could cost about the same as good restaurants in New York. Occasionally, big hotel banquet rooms are used for dinner shows by top pop stars from Egypt and other countries (presented by music agencies) as well as top Egyptian belly dancers. You can book at these hotels. These dinner shows are expensive, and can be $200 USD, or more. It includes a regular hotel dinner. These shows tend to use a very big orchestra - for instance, 50 instrumentalists (both Arab and Western musical instruments) and a 10-piece back chorus. These shows involving at least two groups start very late at 11pm and run 4 hours or so, and the featured artist will appear in the wee hours of the morning. 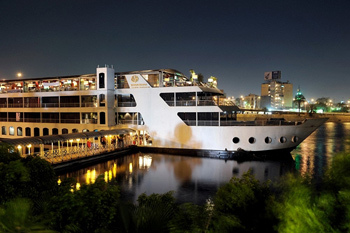 There are three kinds of music boats: (1) dinner cruises, (2) stationary and floating night clubs, and (3) boat and musicians for hire. (1) A dinner show with typical Egyptian music and dance - folkloric, pop, and belly dance music are performed, with a belly dancer for the belly dance, and a male dancer doing a stick dance and a whirling dervish. The food is good. You can book these through your hotel. Boats depart at 8pm, and some also have a second later cruise as well. (2) Night clubs with belly dancers. Your hotel may know which one is good. (3) There are traditional "Takht" musicians that you can hire on the spot by the river for two hours, and then a small boat will take you up and down the Nile River while two or three or four musicians play traditional music for you. However, you will need a local friend to negotiate all this. I know there are many night clubs with live music and belly dancers on Pyramids Street in Giza, but I personally have never been in one of these sleazy places. Unescorted women should definitely not go there to avoid trouble. And if you do go there, don't forget to negotiate the price before you sit down. Otherwise, you could be in for a shock! A video from the band's appearance at Tahrir Square during the recent uprising. Egyptian band playing Rai music of Algeria. Saeed is the Egyptian vocalist with the Algerian voice. The vocalist Mohammed Beshir comes from the Upper Nile (Nubia in the south). Amro is the president of the jazz association of Egypt, which runs the Cairo Jazz Festival every March. Egyptian men think this is Western music for girls. Newer than Hakim, working class popular music. At the Cairo Opera House. Features Egyptian and other Arab musicians. 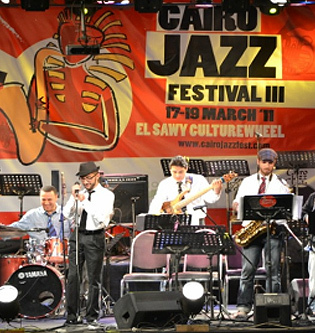 Egyptian and international jazz artists perform at El Sawy and Cairo Jazz Club. Belly dancers from around the world come to the Mena House Hotel next to the pyramids in Giza at the end of June for weeklong workshops and performances for belly dance. Organized by Raqia Hassan, former dancer with the Mahmoud Reda Troupe. A parade of Egyptian dance masters teach students from all over the world.